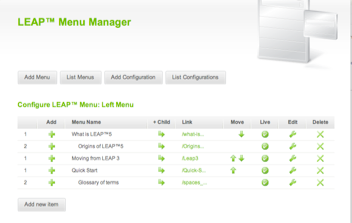 In the LEAP™ Menu Manager from the list of existing menus, select the Menu to Configure and open using the green Configure icon. 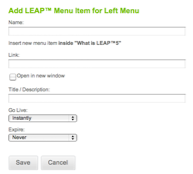 You will see the Menu items and their position - primary, secondary, tertiary or more, indicated by the number on the left hand side, and by indenting where the menu item is a child of the item above. When you add a sub-menu you can see it directly under the Name field showing the position that this new menu item will be. TIP! if you want to take the page down immediately, edit the expire date to yesterday!